Further below are various sources available to locate used tadpole trikes for sale. Keep in mind that tadpole trikes usually sell quickly so one needs to act fast. Another option is to sign up for Google Alerts. Actually this option is a great one as it not only lists lots of trikes for sale but anything else related to recumbent tadpole trikes. Google will send you an email showing you whatever is being posted online about whatever you enter as the search criteria. Be sure to select “as it happens”, “everything” and “all results” so you will find out about trikes for sale which have been posted online as quickly as possible. Select your “Language”, “Region” and provide your email address. I would suggest creating a Google Alerts for “recumbent trikes” and “tadpole trikes”. It doesn’t seem to make any difference as to whether you use trike vs. trikes in your search criteria. Upon creating the alert Google will send an email to you with a link you must click to confirm the alert setup process. 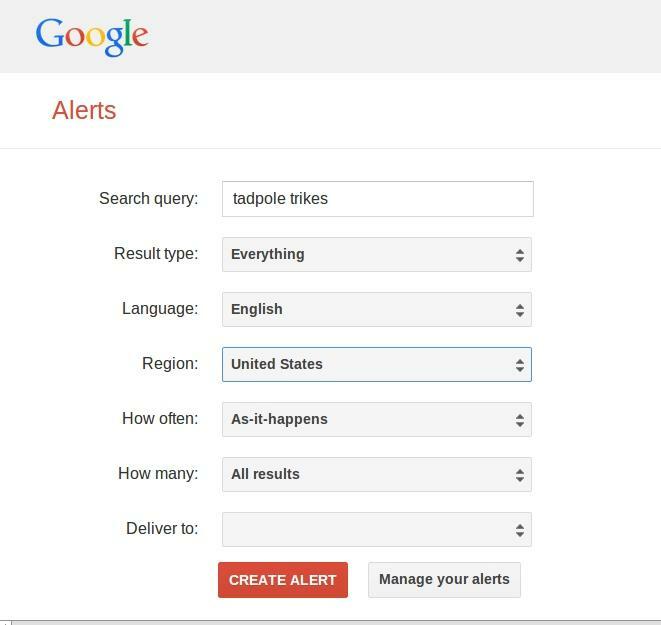 Cancelling these alerts is simple enough although you may want to keep receiving them if you have an interest in tadpole trikes. There are also some bike/trike dealers around who sell used trikes, but I choose not to list them here. I’m interested in your bicycle. My offer would be 300.00 cash and I will pick it up. I will sell it for your offer without the large basket. You are practically stealing the bike at that price as we are taking a tremendous loss. However, I am finding that there just does not seem to be a market for recumbent bikes like there is for trikes. In accepting cash I will first take the cash to a nearby bank to ensure it is not counterfeit. Sorry, but there is just too much of that going on nowadays.